One of the huge fish at Kilthorpe Pools. Expect it to be busy down at Ferry Meadows over the next few months now huge catches of bream are being taken. 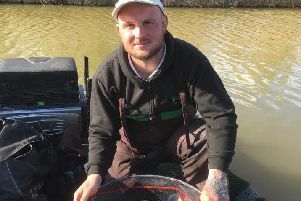 In Sunday’s open match Rob Fry put 130lb 14oz to the scales, all taken on long range feeder tactics from peg 126. Runner-up was Matt Winson with 118lb 9oz and third John Turner with 102lb 11oz. There’s good news for the area’s big fish anglers as a brand new day-ticket water - Kilthorpe Pools at Ketton - opens its doors on Monday. Peterborough DAA hold their AGM at Fletton Ex-Servicemen’s club at 7.45pm tonight while Whittlesey AGM hold theirs tomorrow at Whittlesey Conservative Club at 8pm. One of the area’s great angling characters, ‘Mac’ Page, has sadly passed away. He was a regular at Decoy Lakes, Railway Lakes and on the fenland drains. He was a mine of information and was always willing to pass on his vast knowledge. He was a true gent and I will miss him greatly.